In sports, commentators and analysts often talk about the necessity of team chemistry and players "being on the same page" to win. Teams with long and sustained success are characterized by their "winning culture" that establishes expectations and chemistry. What comprises this culture? How do these successful coaches build it? As much as it applies to the sports world, building a distinct team culture is part of any successful business strategy. Team chemistry remains important not only to wins and losses on the court or field but also to financial success and career growth in the office. As a coach, manager, or executive, feeling confident that your players or employees can operate without your clear instruction can be a relief and makes your job easier. An established culture allows team members and employees to not only know what is expected of them but also allows them to check for the actions of their teammates. This expectation will let you focus on the larger goals. How do we define a team culture? How can a leader foster these elements within a diverse group of individuals? This article delves into this topic to guide coaches and business leaders in building a "winning culture" that promises sustained success. A team culture includes a set of collective goals and a foundation for group dynamics. The principles, methods for group engagement, and team's ethos developed by its leader help make collective goals achievable and drive group behavior. Team culture is thus shaped by its collective values and objectives that create norms that members will follow. With an established culture, your team can develop its expectations, and a certain mold can take shape for the actions of the group. Coaches and business leaders must be able to work with diverse people with different backgrounds, personalities, career goals, and skills to reach common objectives. With well-defined roles, a team culture can truly be established. The group can then complete most daily operations on its own. To establish a successful culture, a leader must demonstrate that a certain procedure and way of thinking can bring both collective and individual success. This thinking means that a team's goal should be defined and your team's expectations for each member should be established. Team members must also feel that the goals are worthwhile and realistic. They must think that the norms and values instilled by their leader will help. Thus, a "winning culture" will be based, at least partially, on the team's belief in you. Fostering this belief is key to fostering the winning culture. An open team culture that includes new ideas grows from compromising between individual ambitions and team-oriented goals. The objectives of your team contain input, and your team will feel part of the process. Allowing members to voice concerns and ideas will allow them to combine their interests with the team's objectives. This strategy also helps everyone feel like part of the group's overall direction. Whenever possible, you want your team to be invested in the institution's success in a tangible way. Legendary football coach Bill Walsh recognizes the importance of checking your ego to create an organization that allows for structured individualism. He notes in a Harvard Business Review interview that this will remove peoples' fear of voicing opinions. Do not be dismissive of your team's thoughts. Genuinely hearing new ideas involves understanding them and being open to incorporating them. As a leader, however, these ideas still need to be part of your vision. Do not be quick to sacrifice critical elements of the team's values when considering ideas. When a culture has successfully been established, you probably will not hear as much feedback contradicting team values from the group you manage. Listening to and implementing new ideas requires flexibility. Marvin Menzies, head coach of the men's Division I basketball team at the University of Nevada, Las Vegas, understands the importance of this leadership trait in interacting with his staff to create a winning team culture: "I've learned leading requires being flexible and adapting. It can't just be about what matters to me since that results in failure," he said in an interview with The Azara Group. "You have to balance what's important to your staff to maximize their efforts for collective success." While you should choose the team's values when developing a successful culture, you still need to take a multilateral approach. Flexibility and openness foster the kind of creative ideas that can jump-start a project or turn around unfortunate trends. The original mold for your team must always be open to change, especially after a distinct team culture is established. Being overbearing about methods and expectations will not only hamper your team's trust in you, but it will also stifle individual talents and creative solutions that could lead to continued collective achievement. In establishing your team's culture, communication is key. Make team goals understandable and create an atmosphere that welcomes feedback at every level. Communicating does not always mean stating commands. You have to strike a balance between being open to input and expressing clear directives while still maintaining authority. Try to offer comments and suggestions to build your team's trust in you. This will reinforce the kind of work that leads to success and will encourage members to continue seeking these results. Communication will also help you evaluate how team members can best work together and for which roles they are best suited. This will necessitate delegating responsibility and communicate every role's importance to the team. Adapt your methods and experiment with incentives to unify your team while maintaining individualized roles. In cases where members' ideas cannot be reconciled with team goals, or members question their roles, it becomes especially important to remain transparent about your reasoning and how your decisions will lead to success. Your team may see common failures that can affect any collaborative work. Often, these failures stem from changing goals and circumstances, including new team members joining, reliable team members leaving, and leaders steadfastly clinging to tactics and a culture that has stopped succeeding. Clear communication, flexibility, and openness are central to solving these problems. 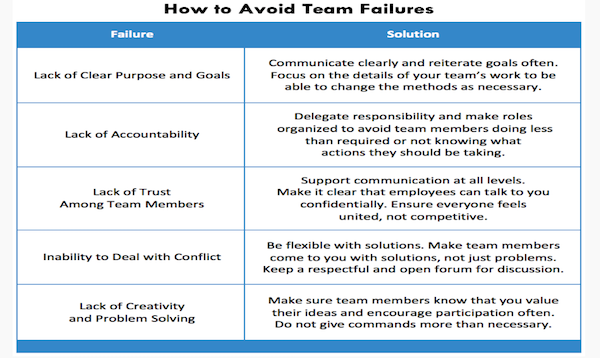 The chart below outlines some problems you may face and the methods you can use to avoid or solve them when establishing your team's culture. The culture-building process can be a delicate one. You must find a compromise between the different individual interests of your team, while also maintaining unified goals and certain shared values across the group. Organizational culture and team principles are not adopted instantly, taking time to embed within any group. Team members need to trust your leadership so you can cultivate a group culture that establishes an environment supporting your broader objectives. To achieve this, you may need to show them why your vision will work as the leader and ultimate decision maker. Following the tips above will help promote their trust in you to build this culture. Your success in doing this will allow your team to reach its fullest potential and will be a direct measurement of your success.